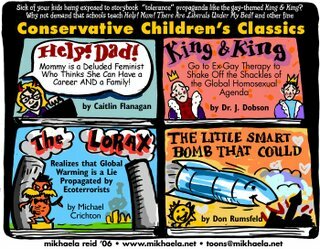 New Cartoon: "Conservative Children's Classics"
Last week I made fun of what conservatives wear, and now I'm mocking what they read to their children. I'm so ashamed. But seriously... Much has been made in the mainstream media of the so-called backlash against feminism. Writers like Caitlin Flanagan, John Tierney and Charlotte Allen would like us to believe that feminism has made women unhappy, and that professional women are leaving the workplace in droves for the joys of homemaker-dom (see Caryl Rivers for an excellent debunking of this insubstantiated hogwash). Meanwhile, conservative parents in Massachusetts and elsewhere are outraged that their children are being exposed to insidious diversity tolerance propaganda, like the sweet and innocuous fairytale King & King. They'd much rather their children be read books like "Help! Mom! There are Liberals Under My Bed!" and other Conservative Children's Classics.